Italian classics with Sedona flair in a romantic setting. : Executive chef Andrea DiLuca and sous chef Lisa Dahl serve robust, authentic Italian food. The extensive menu includes such starters as mushrooms stuffed with mozzarella and fresh basil in Chianti sauce, while a light bruschetta will inspire summer dreams. House-made pastas are made daily and feature creative combinations like fettuccine with prawns sautéed in mushrooms, garlic and tomatoes, or tortellini with prosciutto and green peas in a delightfully delicate Alfredo sauce. House specialty entrées include veal sautéed in a garlic Marsala wine sauce topped with prosciutto and mozzarella, chicken breast piccata, and calamari steak in a lemon garlic Chardonnay sauce over capellini. 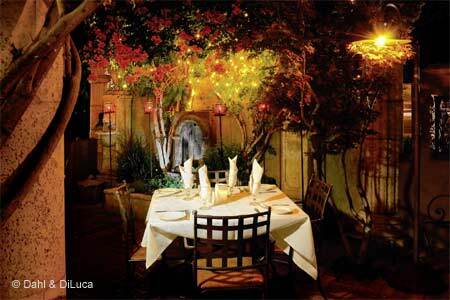 The outdoor patio will transport you to Tuscany with rose petals delicately strewn on crisp, white tablecloths.